This version of the guide has been superseded since you can now use the Apple Bonjour service and the Raspberry Pi hostname instead. This version of the guide allows you to set up the Raspberry Pi with a fixed local IP address, for some this is an easier solution, so I’ve kept this version available too. 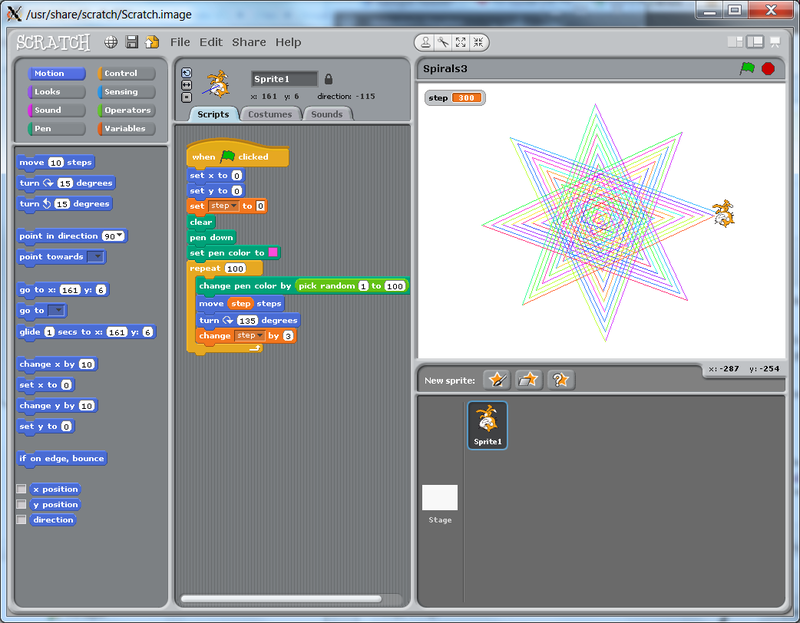 You can also use the Pi-Kitchen, see Recipe 001-Direct Network for more details. A good way to remotely control a Raspberry Pi is to connect it to a network and use one of the methods discussed in the Guide to…Remote Connections. This will provide access to the terminal, by usig SSH, even the ability to view the desktop using VNC, or the ability to run graphical programs as if they were running directly on the laptop itself (see below for X11 Forwarding). We just need to make the network link work directly without requring a full network setup (with Router etc). Normally, if you take a Raspberry Pi and directly connect it to a network, it will attempt to automatically find an IP address (see bottom of the page for information about IP Addresses and what they are) by requesting one from your Router or other device running a DHCP server (a protocol which automatically deals out addresses to computers as they attach to a network). However, if you connect the Raspberry Pi directly to another computer, not a lot will happen. The Raspberry Pi won’t get an IP Address since there isn’t a DHCP server to talk to (it can’t talk to anything other than the laptop). Other computers will often give themselves a default address (in the address range 169.254.0.0 – 169.254.255.255) but the Raspberry Pi doesn’t do this (yet). Besides even if the Raspberry Pi did, we would still need to know what address it had picked to be able to connect to it! To get around this, we have to give the Raspberry Pi a fixed IP address (i.e. we tell it what it’s IP Address should be so it doesn’t have to wait for one). There is just one complication to this, and that is if your laptop is configured to a fixed IP too. At first this may not seem like a problem, since if both IPs are fixed then we will know the address of both computers every time. However for them to be able to talk to each other directly, they need to have similar addresses (at minimum the first number should match, but we shall match at least the first 2 in this case to work with default network settings). For more information on this, see the section at the bottom of the page about SUBNETs. Before we power up our Raspberry Pi, we can have a look at the network settings of the computer we are planning on connecting to and determine if the address is automatically allocated or fixed. From the Start Menu, run the “Control Panel”. 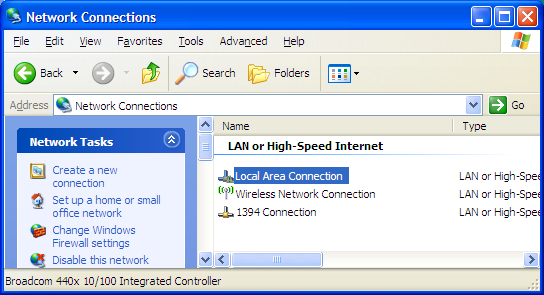 (Windows 7/Vista) Open “Network and Sharing Center” and click on “Change adapter settings” on the left side. Find the item which relates to your Wired network adaptor (by default this is usually called “Local Area Connection”). Right-click on it and open “Properties”. Select the item which is called “Internet Protocol (TCP/IP)” or “Internet Protocol Version 4 (TCP/IPv4)” if there are two (the other is Version 6), and open the “Properties”. 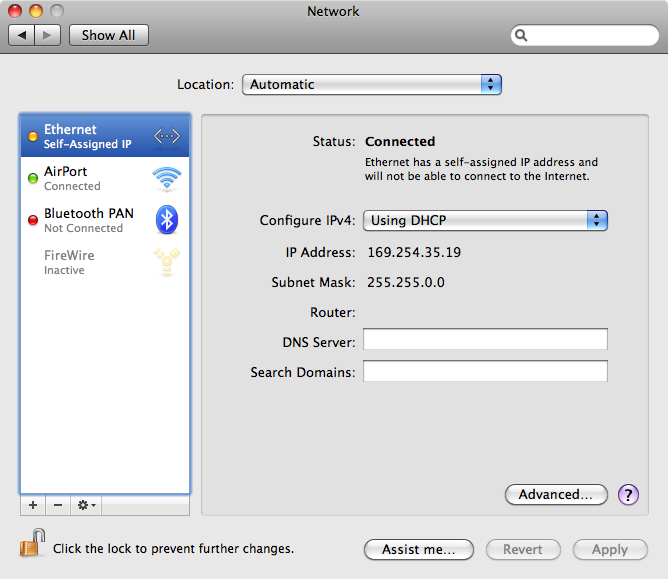 Hopefully, the IP Address will be set to “Obtain an IP address automatically”. If not don’t worry, just take a note of the IP address and Subnet Mask set here (you may find the rest of the information useful to keep, but we won’t need it this time). If you know what you are doing, you can change this setting to automatic, or you can leave it alone (we shouldn’t need to adjust it as long as we know the IP Address). You will need to locate the settings for your wired adaptor and check to see if the IP Address is configured automatically, or fixed to a specific value. This quick method skips all of the testing which can be performed if we have a Raspberry Pi running with a monitor and keyboard attached. If you run into problems, then follow the steps in Option 2, to test the network settings. 1. Ensure the Raspberry Pi is powered off, and remove the SD-Card. Insert the SD-Card into a card reader and plug it into your laptop. Find the drive and you should find several files on the Card (note it a lot smaller than you’d expect since it is only the boot section of the Card (the rest is hidden)). Edit cmdline.txt and add the IP address at the end (be sure you don’t add any extra lines). For network settings where the IP address is fixed, use an address which matches the laptop/computers address except the last digit. Ensure you take note of this IP address (you will need it every time you want to directly connect to the Raspberry Pi). Return the card to the Raspberry Pi. 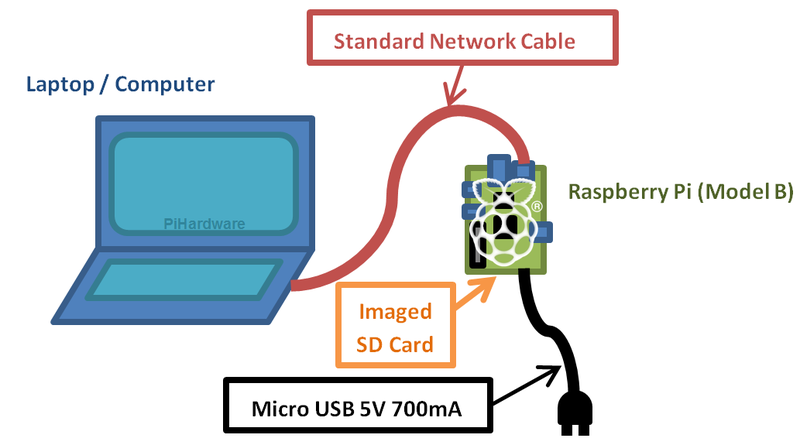 Attach the network cable attached to both the computer and Raspberry Pi and power up. You will need to wait for your computer to finish detecting the network settings (you may see a small networking icon flashing in your system tray while it does, or open up the network settings to see when it has finished and has an IP address) – it can take around 1/2 minute. Your computer may report the connection as “limited or no connection” when connected to the Raspberry Pi in this way, this is normal as indicates it is a direct computer to computer connection rather than a standard network. If you forget or decide not to plug in the network cable, the Raspberry Pi will wait 2 minutes (or until you connect the cable) before completing it’s start-up (so if you only have a keyboard and monitor attached, you need to wait!). You will now see that having a keyboard and monitor available at this stage is helpful for when we set this up, as we can test each step. Boot up the Raspberry Pi and plug in the network cable to both machines. When the Raspberry Pi has booted ensure you log in and open the terminal if not already open. You will probably find that nothing is shown, as this is trying to show you the current IP address (which is not allocated yet). If it does show something, then you may have already have a fixed IP address (if you do take note of it in case you need to put it back later). 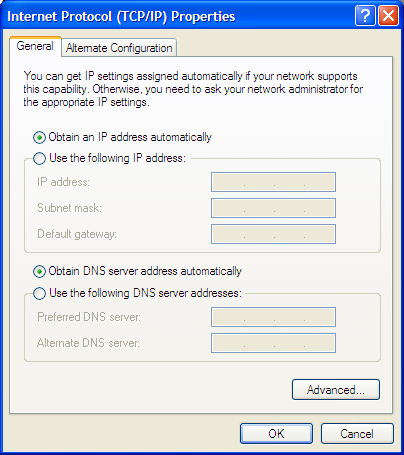 For network settings where the IP address is fixed, use an address which matches the laptop/computers address except the last number. You will see we now have the IP address set. We should now be able to “ping” the laptop. 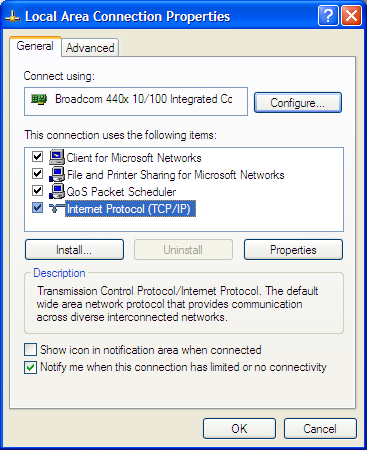 Find the laptop address (if it wasn’t a fixed address) by returning to the list of Network Adaptors in windows and double clicking on the icon to see it’s “Status” (don’t worry about the warning of “limited or no connection”). Then select the “Support” tab and then “Details”. You should see the laptop’s IP address. We should get lots of responses (the laptop is responding the Raspberry Pi through the network cable)! Ctrl+C to stop that. (If you didn’t then double check your connections and the IP addresses you are using). As mentioned before, the new IP address will be lost when we reboot, so we need to ensure it is set every time we boot (or at least every time we want it to be when we boot). To do that we can edit the “cmdline.txt” file which is located on the boot partition of the SD Card. 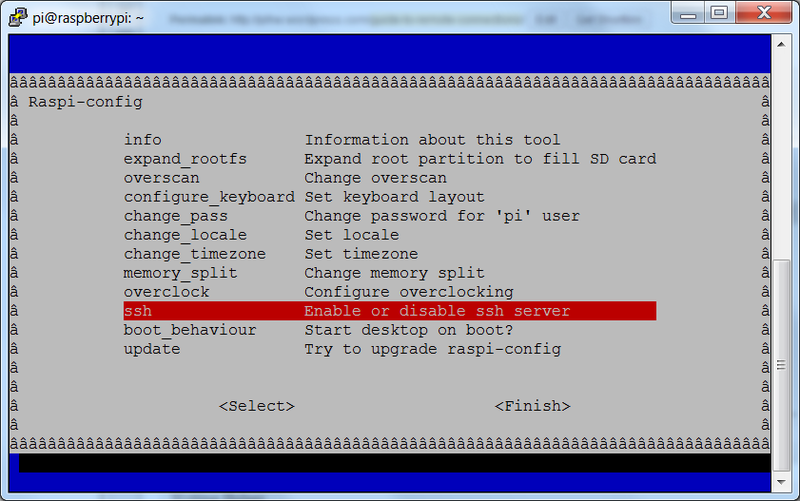 You can now reboot the Raspberry Pi (sudo reboot), and next time the IP address will be automatically set. To change between configurations, simply use the following commands (just remember to edit /boot/cmdline.direct if you need to change the IP address in future). Now you should be able to do most of the things you would normally do when connected to a network. It is even possible to use this direct network link to share your laptop/computer’s internet connection (if it is connected via Wifi for example), although I’ve not needed to do this yet. More details of what each part means and other kernel options is detailed in section 2 of this kernel documentation. The following script will prompt to allow you to change your settings (just type ./switchip.sh to run). Just press ctrl+x and y, to save and exit when you are done. You could even extend this to allow you to setup fixed IP addresses for different networks, so you can always be sure you can find your IP and connect correctly.